These caskets are made from Ash and are available in 3 sizes. 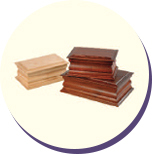 All beautifully made in a classic style they are available in two colours: Natural or Mahogany Stained. 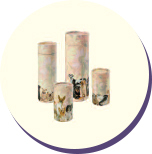 We have a range of Scatter Tubes which will suit your needs. We offer several sizes and this product is free. 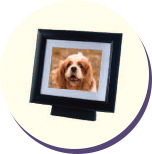 Tribute frames have ash containers constructed within the frame for a discreet, personal memorial. Available in Satin Black or in solid wood with a Natural Oak veneer. 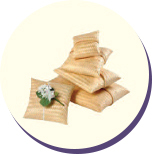 Burial Bamboo Pouches are hand woven in bamboo and totally biodegradable. This product is free. 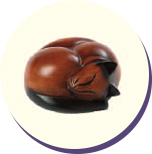 A poignant and popular choice for our feline friends. Hollowed out to contain your ashes. We have a choice of three colours, tan, tan with black ear tips or full black. We offer a same day collection zone, this serves Callington, Liskeard,Saltash, Tavistock,Launceston and areas of Devon including Plymouth.